If you are going to Luang Prabang, or know someone who is, please read these links and share the information. Model good practices, even if people around you are not, and talk to other travellers to get them to change their behaviours. 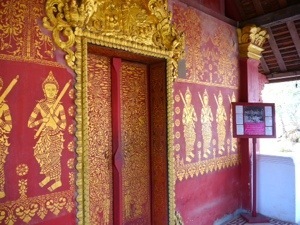 I am in Luang Prabang, the ancient royal capital of Laos and a UNESCO world heritage site. This city has hundreds of monks in over thirty temples, and every sunrise they walk barefoot, in meditative silence, through the streets of this beautiful town to collect alms from local people. Hundreds of tourists also line the streets. They run after the monks, cameras in hand and flashes blazing. They take close up pictures of monks and alms-givers, clearly disrupting this religious ritual. Others stand back — somewhat — but talk in loud voices, chatting about whether their photos are turning out, the excursion they went on yesterday, where they ate dinner. In some parts of town, the camera flashes are like strobe lights. Despite the chilly weather, some tourists are wearing short skirts and shorts, and underneath one hoodie I see a low-cut crop top, cleavage and navel ring bared to the world. Other tourists are participating in the ceremony, dropping into the monks’ alms bowls packages of rice that they bought from ladies wandering the street. They make sure their camera-toting friend has a good shot of them while they deposit the food, but because they’re not paying attention, both the photographers and the alms-givers sometimes jostle the monks. 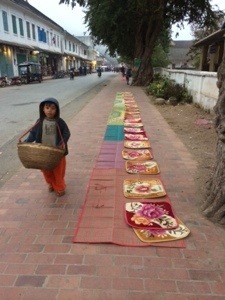 Young boys follow the monks with baskets, and the monks discretely drop the tourists’ packages into them. This food has made monks sick in the past — some of it is leftovers from the seller’s family’s meals yesterday. Mini-vans roar by, headlights making monks squint as they walk through the misty dark streets, when they are meant to be walking in meditation. Some monks want to discontinue this beautiful practice because the tourist behaviour is so disruptive. Most Lao males spend some time as a novice monk, so many of the men living in Luang Prabang now, including those you meet at restaurants and at your hotel, will have collected alms in Luang Prabang’s streets. If pressed, they will reluctantly and politely tell you how stressful some of the tourists’ behaviour is for the monks. Luang Prabang has made efforts to improve the situation — there are signs posted at the temples that tourists photograph during the day; tourism students patrol the streets during the ceremony and try to curtail the worst behaviours; many (but not all) hotels give their guests information. Thank you Pamela. I’m not sure how travellers became so disrespectful either, but hope they can change. The Lao tourism authority does have signs printed in several languages, but sadly many people don’t read them or don’t care. I personally think tour operators are very much to blame. They should be educating their customers. Plus the tourism authority should consider sanctions against companies that don’t respect the rules. We gave alms to the monks in Luang Prabang back in March this year. We were more or less on our own and it was a very peaceful affair – if a little stressful for my family and me (we were very conscious that it’s a serious matter and didn’t want to get it wrong!). I don’t think it’s always like you have depicted here, although even just sometimes is already too often. Thank you Jeff. It is easy to get away from the disrespectful tourists, especially in low season … but the monks still have to pass by the “bad” ones … I hope it can change though and I’m glad you had a good experience. Thank you for being so cautious and respectful! Johanna, Thank you for this posting/article. I lived in Laos for 7 years and I saw terrible behaviour by tourists increase each year regarding monks and temples (and clothing in general). Whenever I was in Luang Prabang I found it hard not to point out to people how rude they were being. Sadly, they rarely got it. I have always loved to watch the trains of monks in the misty early morning as they collected alms. I hate that it is not such a peaceful practice for them any more. Thanks to everyone who has read this and commented, and especially to those of you who have shared it. It has had over 1000 page views in the past 2 days – thank you! and if it ‘s all a money making circus…. think to hotels who charge very expensive and not worth rates only because tourist flock in to see the Lord Buddha Caves, the early morning Monks collecting alms, donating money to temples, …. lets blame ourselves first, then the tourist… they are the last tread of the chain.. Thanks Mak Yes … It is certainly not tourists alone who are causing the problems. 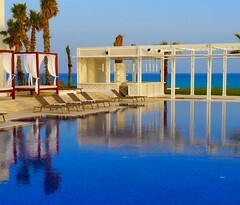 But I was impressed with what several of the hotels are doing to make things better. Slowly but surely? Thank you for writing this article. There are some people who are just disrespectful of another country’s ritual/culture/religion. I don’t see how some people can go to another country and while walking around a temple, just think it’d be okay to lay down on a Buddhist statue or kiss a Buddhist statue. Would they behave this way if they were in their place of worship? I doubt it. 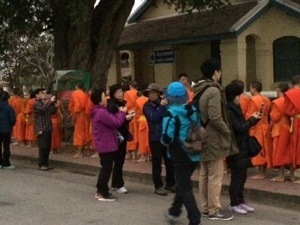 I really hope the monks continue to collect alms; and also hope these disrespectful people stop talking loudly while giving alms; stop taking pictures with the flash on; & at least cover up just a little bit when you know you’re going to be at temple/around elders/monks while in Laos. you are unnecessary apologizing your self “on behalf of all tourist”(???). First of all there is nothing can disturb the man who’s in the space of meditation. Second, you your self was involving into that photo session, right? So just be relax and watchful of what you are experiencing. May peace on you, sister….shanti, shanti, shanti. You’re right — the most important think is to be mindful and watchful to make sure we’re not disturbing others. It is pretty easy to stand on the other side of the street and watch the tak bat but it is also easy to forget and move too close, especially when there is a crowd. Sadly some of the tourist behaviour _is_ distributing the monks while they’re in meditation — so much so that some senior monks have talked to Luang Prabang officials about discontinuing the practice. I hope that a compromise can be reached so that tourists can still witness such a beautiful tradition, but do so in a way that doesn’t disturb the monks or the alms-givers. I couldn’t agree more. The crazy thing is is that with our modern cameras we don’t have to get up close for a ‘close up’ you can stand across the street and still get a close up picture. It is weird to see tourists take a photographer’s croutch like they are National Geographic photographers in front of the monks. And, also weirdly, the monks return to the temples later in the morning, on the adjacent street where there are NO tourists, just locals giving alms. So, if you wanted an authentic picture, you would find it there. I guess this is a case of too much tourist ‘love’ spoiling the views. Thanks Stella – yes, I think this mostly comes from tourist “love”, as you say, that has just become misguided. And bad behaviour tends to breed bad behaviour (“well, if that guy is doing that, no one will notice if I do it too …”) . 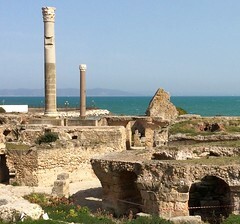 If we remember first that people aren’t tourist attractions, that should help! I totally agree with you. 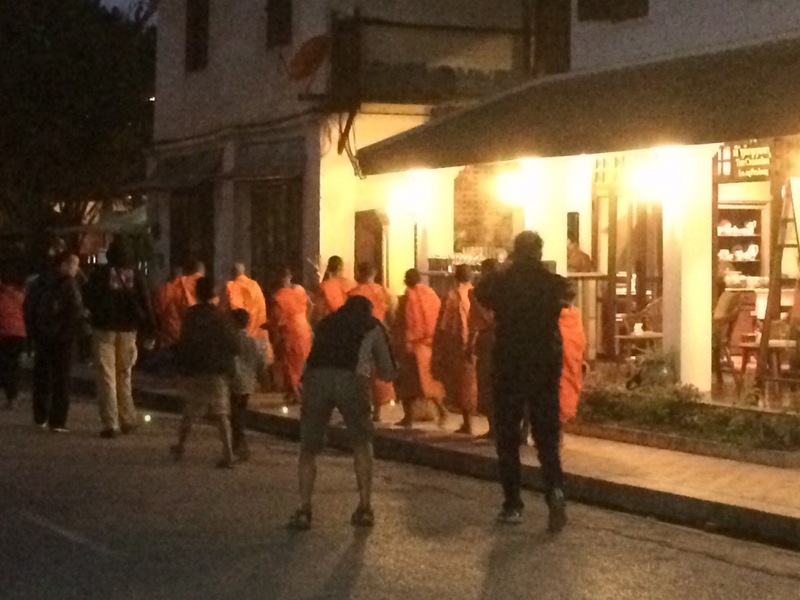 Because of this behaviour I didn’t go to the early morning walk of the monks when I was in Luang Prabang, Laos! It is a tough call Jacomijn … When does watching or taking a photo help and when does it hurt? Thank you very much Brian – yes, of course, I’d be happy to help in any way I can (although the photos aren’t very sharp, given the early morning light … And there was no way I would use my flash!). I’ll get in touch via email. Could you Please translate this in Lao, Thai, Chinese & Korean. Thank you Chris … Any volunteers out there? Although, those of us that read articles like this, the information in hotels, and the signs posted … We’re not usually the problem! I don’t mean to make broad generalizations, but from what I observed about who were taking the most obnoxious pictures…. Chinese would be most helpful. Yes, there are a number of guilty parties in Luang Prabang, and I find that tour groups are the worst. I don’t understand why the tour leaders don’t give better instructions to their groups and enforce the rules. Luang Prabang officials also have a key role in enforcing the rules. The situation gets worse every year, yet it wouldn’t be that difficult to make it better. I would love to be connected to tour operators and Luang Prabang tourism officials to help. I am glad you have spoken up for all us tourists who visit Buddhist countries and especially for the monks in Luang Prabang. It sounds much worse than it was six years ago when I was there and is such a pity. We all need to be reminder that we need to curb our insatiable desire to get that perfect picture and respect the privacy of others. Thanks for reminding us. Dear Johanna: I work with the Buddhist Project organization which arranged the production of the posters and brochures that are distributed around the Tak Bat alms ceremony each morning. One of our sponsoring foundations is building a web site which will include our activities in Luang Prabang – and have a section on cultural awareness. I would like to ask your permission to copy and use two of the photographs in your article – as they graphically illustrate the problem. See my personal email address below if you need to contact me directly regarding this. Many thanks for your trenchant and well written story!